An eco alternative for single use plastic fruit & vegetable bags. Made from certified organic cotton which means the crops aren’t treated with pesticides, insecticides, herbicides and less water is used in its growth. Being 100% organic cotton, this bag can be composted, so it is a zero waste product. Each bag is washable, reusable and sustainable. See through mesh bags allow shop assistants to know exactly what’s inside at a glance. Each bag can carry up to 2 kilos. 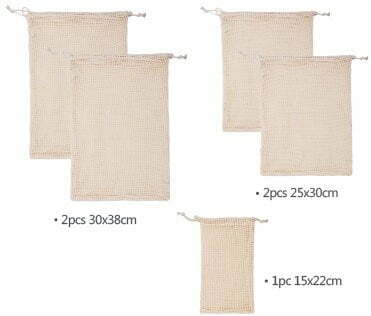 2pcs 30x38cm, 2pcs 25×30, 1pc 15x22cm.